I thought I'd take a few minutes to introduce you to Padraig Harrington. 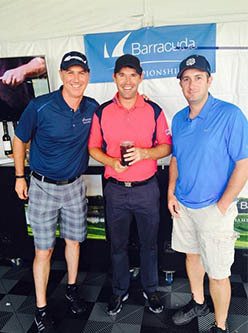 Padraig is a professional golfer with three major championships under his belt, and the Barracuda logo on his shirt. Padraig was born in Dublin in 1971, started playing golf at the age of 4, and entered his first amateur tournament when he was 15. He racked up a number of accomplishments in his early years, and then turned pro in 1995. Since then he has had 25 tour victories, including The Open Championships in 2007 and 2008, and the PGA Championship in 2008. Padraig will be playing next week at The Players Championship, May 7-10, in Ponte Vedra Beach, Florida. For more info on his schedule and career, check out his website here and follow him on Facebook here. Say hello to him on Twitter @padraig_h.